The Tail Waggin' Winterfest is the highlight of the season in the famously pet-friendly Pocono Mountains town of Sylvan Creek. 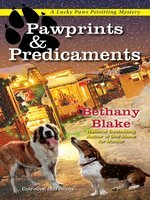 But despite attractions like an ice sculpture display, a dogsled race, and gourmet hot chocolate, Daphne Templeton finds herself annoyed by TV producer Lauren Savidge, who's filming the festivities. She's critical, controlling, and as chilly as the January air. Daphne would like to tell her to go jump in a lake—and as a matter of fact, that's exactly what they're both going to do . . . It's the first-ever polar bear plunge in Lake Wallapawakee, and Daphne and Lauren are among the eighty or so people who charge into the frigid water to raise funds for animals in need. Daphne makes it back to shore—with the help of a mysterious St. Bernard—but Lauren is dragged out stone cold dead. Now, with her trusty basset hound Socrates at her side, Daphne intends to assist Detective Jonathan Black in his investigation—whether he wants her to or not . . .
Bethany Blake lives in a small, quaint town in Pennsylvania with her husband and three daughters. When she's not writing or riding horses, she's wrangling a menagerie of furry family members that includes a nervous pit bull, a fearsome feline, a blind goldfish, and an attack cardinal named Robert. Visit Bethany at www.bethanyblakeauthor.com. Mystery Scene "Amusing and intriguing."